Blowing Rock is a small town in the Blue Ridge Mountains of North Carolina known for scenic beauty and friendly charm. Blowing Rock is located on the Eastern Continental Divide and adjacent to the Blue Ridge Parkway and the Pisgah National Forest, giving residents and visitors access to gorgeous views and myriad outdoor activities. A destination that experiences all seasons, the village is a snowy wonderland in winter, a riot of wildflower blooms in the spring, verdant green in the summer, and vibrantly hued in the fall. The downtown area feels like an old-fashioned village, with lots of unique shops and restaurants, cozy inns, galleries, a central park, and an art & history museum. The town's proximity to Appalachian State University, just 8 miles north in Boone, provides even more opportunities for arts, entertainment, education, and cultural enrichment. Some of North Carolina's most well-known attractions are in or near Blowing Rock, like Tweetsie Railroad, Moses Cone Memorial Park, Appalachian Ski Mountain, Mystery Hill, Price Lake, and Grandfather Mountain. Blowing Rock is centrally located in the High Country of North Carolina. Residents and visitors enjoy miles of outdoor spaces, protected in National and State Parks. Moses Cone Park, with access near downtown Blowing Rock, offers 26 miles of historic carriage trails that are now used for walking, running, hiking, and horseback riding. Blowing Rock is also on the Blue Ridge Parkway, which provides opportunities for more hiking, plus canoeing, fishing, camping, and more. The region is home to 3 major skiing areas, several wineries and breweries, renowned restaurants and accommodations, and dozens of family attractions. Blowing Rock hosts events year round, like WinterFest, Savor Blowing Rock, the Art in the Park series, Concerts in the Park, Symphony by the Lake, and the Blowing Rock Classic cycling event. The town hosts holiday celebrations too: 4th of July Festival & Park Dance, Halloween Festival, and Christmas in the Park. The Blowing Rock Art & History Museum hosts rotating exhibits, films, lectures and concerts all year, plus offers programming for kids and adults. There are numerous opportunities to enjoy live music in town, too, from weekly jazz performances at the historic Green Park Inn, to Music on the Lawn on Fridays in the summer. Concerts in the Park and the Monday Night Concert Series are well-known summer music series that happen inside our beautiful town parks. Appalachian State University in the neighboring town of Boone, just 8 miles north, offers more theater, dance, and arts entertainment, as well as the renowned month-long Appalachian Summer festival in July. The High Country is home to numerous dance companies, theater groups, and musical performance opportunities. Blowing Rock offers free shuttles during major events. The AppalCart, Appalachian State University's public transportation system for Boone, offers regional rides on weekdays by appointment. Regional taxi services are available by phone call/appointments. Blowing Rock is about 2 hours north of Charlotte Douglass International Airport. Appalachian Regional Healthcare System is the healthcare leader in the High Country. It is comprised of two excellent hospitals, an extensive physician practice management group, and the Blowing Rock Rehabilitation & Davant Extended Care Center, which is the newest facility. Appalachian Regional Healthcare is the area's largest employer, offering advanced medical services including a dedicated cardiology center, rehabilitation facilities, oncology treatment and care, and an updated wellness center. Blowing Rock also has an Urgent Care facility that is open daily, offering a private practice center as well as attention for those unplanned medical needs. Jan 21.3 F° 30.0 F° 38.7 F° 5.6 "
Feb 23.2 F° 32.7 F° 42.2 F° 4.7 "
Mar 30.4 F° 40.2 F° 50.0 F° 6.7 "
Apr 38.3 F° 48.6 F° 58.9 F° 5.9 "
May 47.0 F° 56.7 F° 66.4 F° 6.5 "
Jun 54.4 F° 63.5 F° 72.6 F° 6.5 "
Jul 58.6 F° 67.5 F° 76.4 F° 5.9 "
Aug 57.3 F° 66.2 F° 75.1 F° 5.8 "
Sep 51.6 F° 60.4 F° 69.2 F° 5.5 "
Oct 40.5 F° 50.3 F° 60.1 F° 4.8 "
Nov 32.9 F° 42.1 F° 51.4 F° 5.8 "
Dec 24.9 F° 33.8 F° 42.6 F° 4.4 "
Blowing Rock is well-known for offering an escape from the summer heat of nearby lowlands in NC. Average temperatures in summer are mild with cooling breezes. Fall is crisp, providing the perfect cool climate for vibrant autumn color. Winters can be quite cold, offering lots of opportunities for snow sports, including cross-country skiing. Springs are cool, bringing a wide variety of wildflowers and rhododendrons in our nearby temperate forests. Condos Over 50 Communities Blowing Rock has a variety of homes along winding neighborhood roads on the lush ridges surrounding the town, many with beautiful views of the Blue Ridge Mountains. From summer cottages, to grand estates, many still have a rustic and welcoming feel despite their differences in size. Blowing Rock is a dense community, offering lots of homes within walking distance of the dining, shopping, and entertainment of downtown. Chetola Resort, right in Blowing Rock, offers homes and condos on the grounds, providing beautiful residences with all the amenities of a resort and spa. Gated communities and developments are popular in the region, with several just outside the borders of Blowing Rock, offering large and small lots, community amenities, wooded areas and sweeping vistas. Condominiums are plentiful in the area as well. 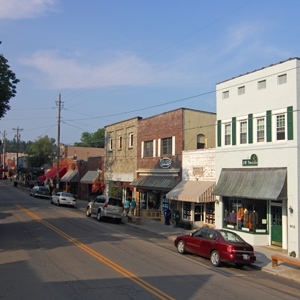 Boone, a college community, drives development of rental properties and apartments in the area, so they remain abundant. Home care Senior center Visiting nurses The Watauga County Project on Aging offers extensive programming and assistance for seniors. The L.E. Harrill Senior Center and the Western Watauga Community Center provide classes, trips, support groups and more. Transportation assistance is contracted through Appalachian State University's AppalCart buses and vans. In-home Aide Services and meal deliveries are available for those in need. Blowing Rock's main economic industry is tourism, so positions in hospitality businesses and customer service companies, particularly part-time, are often available for seniors. Year round tourism also means there are plenty of volunteer opportunities for events and festivals in Blowing Rock through the Chamber of Commerce. Appalachian Regional Healthcare System and Appalachian State University are the area's two largest employers, and they provide jobs for individuals of every age. There is a huge variety of opportunities for volunteers in community outreach programs, environment and conservation groups, cultural productions and preservation, our local school system, and youth programs- all of which can be found in Blowing Rock and the surrounding local area. Examples include the Middle Fork Greenway, Blowing Rock Historical Society, Blowing Rock Art & History Museum, Blue Ridge Conservancy, Friends of the Blue Ridge, Blue Ridge Parkway Foundation, Samaritan's Purse, Blowing Rock C.A.R.E.S., Ensemble Stage, Western Youth Network, and the Watauga Project on Aging.